Welcome to God s Own Country, on arrival at Trivandrum proceed to Kanyakumari. Reach & check-in at the hotel and relax for a while amidst the comforts of your room. Kanyakumari an important pilgrim centre of India, is famous for the Amman Temples – a symbol of unity and sanctity – dedicated to the virgin Goddess, Kanyakumari. To its South – East lies the famous Vivekananda Rock Memorial, Mahatma Gandhi Memorial, and Thiruvalluvar Statue the memorial statue of Thiruvalluvar is in Kanyakumari Explore the rest of the day at your own leisure. Overnight stay at the Hotel/Resort. After breakfast later proceed to Kovalam beach. 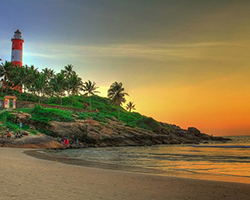 Kovalam is known as the "Paradise of the South". This dreamland is an evergreen, serene, pleasant climatic and enticing beach destination. Reach & check-in at the hotel and relax for a while amidst the comforts of your room. Explore on your own to see how the everlasting sea touches the everlasting sky. Kovalam is the place where one can see the golden sand at the day time & silver sand in the night. With high rock promontory and a calm bay of blue waters, this beach paradise creates a unique aquarelle on moonlight nights. Overnight stay at the Hotel/Resort. Enjoy the sumptuous breakfast. Later proceed for the sightseeing of Trivandrum. The temple of Anantha, the Sri Padmanabhaswamy temple is the most religious icon of the city. Other sightseeing places are Kuthiramalika Palace Museum, the name Kuthiramalika means 'palace of horses' derived from the frieze of 122 wooden horses on the exterior walls. Veli Tourist Village, which has an excellent waterfront park with a wide range of aqua entertainment facilities like fishponds, wading pools and landscaped garden. Shangumugham Beach where one can watch the amazing sunset. Overnight stay at the Hotel/Resort. After breakfast proceed to Alappuzha (or Alleppey) the beautiful coastal town in the Indian state of Kerala. Known as the gateway to the rustic Kerala Backwaters, this town is laid-back and relaxed. If you plan to stay in the town, you can spend your days by relaxing at its lagoons, watching sunsets on its beaches, bird-watching at its lakes, or wandering through its many palaces and temple complexes. Evening return to the resort and overnight stay at the hotel or resort.